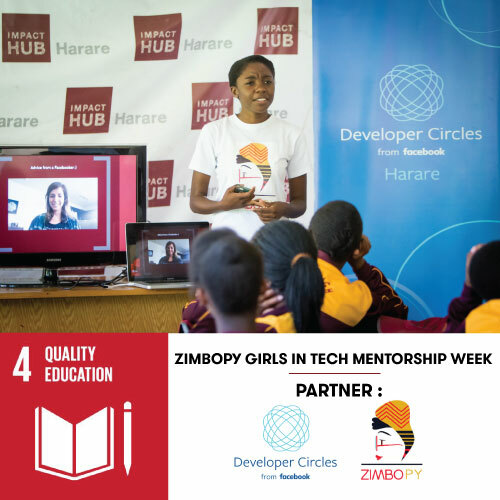 The Zimbopy Girls in Tech Mentorship Week held in April 2018 , was run by Zimbopy in collaboration with Impact Hub Harare. This event was sponsored by Developer Circles from Facebook. The mentorship week was aimed at equiping and empowering young girls and women currently studying or intending to study programs in the STEM field to enter into the working world with all the resources they need to excel. Participants included high school and university students who covered various material from the basics of Python programming to building a project using code to solve a problem in the community. Over forty girls and young women attended this event.